“Unbelievable! It’s a bit like when I won the stage at the Tour de France! Often, when I wait for the sprint, I am fast, but I finish only in 4th, 6th, 8th place… And then there is a little regret. Today I waited for the right moment to attack. I knew I had to find something to not regret, exactly. And that’s what happened. For me the solo victories are the most beautiful. I do try and grab mine in this way. This morning, the plan was to go in the breakaway, which we did with Alexis (Gougeard). My teammates then placed me very well 20 kilometers from the finish, especially on the small roads. I stayed in contact with the best, in the top 10. When we arrived on that straight road, I had hatched my plan and my directeur sportif supported me. 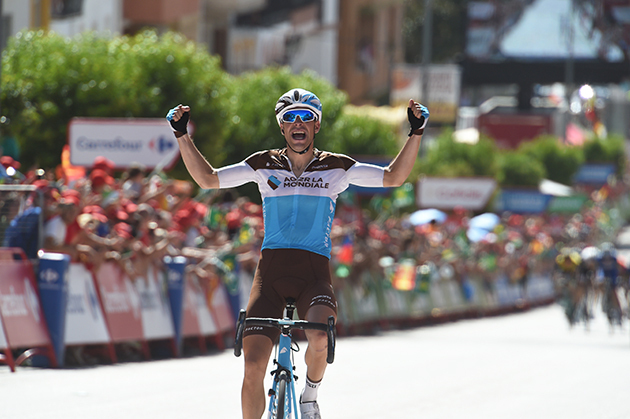 Tony Gallopin wins Vuelta stage seven. Sirotti photo. An undulating stage awaited riders today, with 185.7km of ups and downs to drain the energy reserves of the already tired peloton. The arid landscapes of the previous stages giving way to greenery, the roads were still dry and dusty, which saw plenty of mechanicals and crashes, while temperatures remained high. 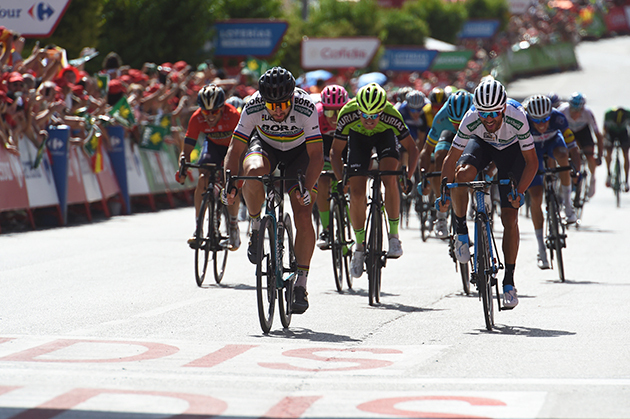 A late attack took the stage win, but in the reduced bunch sprint for second, the UCI World Champion, Peter Sagan, took second place with ease, showing just how much the Slovak rider has recovered in these seven stages. While involved in a crash in the final 10km, Emanuel Buchmann worked hard to finish in the lead group, protecting his GC third spot. Never dropping less than 500m above sea level, stage 7 was undulating all day. While there were just two third category climbs over the course profile, this didn’t give a full picture of how much climbing and descending would take place over this 185.7km stage. On a parcours like this, the outcome would be difficult to predict – the racing wouldn’t be especially difficult by Grand Tour standards and would be unlikely to challenge any of the riders, but the breakaways in this race have been aggressive and committed, while the final third category climb, the Alto de Ceal, had the potential to act as a launchpad for a late attack, summiting 12km from the finish. If it was all together at the end of the day, the punchier climbers and all-rounders were the ones who would be in contention here. Today’s stage being less clear-cut than others, it would be important to prepare for how the day might unfold, as well as being able to react to the less predictable events. If there was a big break to start the day, Rafał Majka and Davide Formolo would work to jump in this. Otherwise, the whole team would work hard to keep the pace high in order to keep the break in check and make sure they weren’t able to stay out until the end. The finale would suit the punchier all-rounders, and it was here the team would be working both to bring the UCI World Champion, Peter Sagan, into position, while also protecting Emanuel Buchmann. There were plenty of opportunities for late attacks, and with just a few seconds separating some of the top places in the GC, it would be important to keep a watchful eye on the overall contenders. Wasting no time in attacking at the start of the stage, the day’s break consisted of seven riders, who worked hard to build up a gap on the hills in the opening kilometres. Pushing their lead out to 3:40, this was as much as the peloton would allow, with plenty of riders in the main group who would have their eye on taking the stage win today. As the race neared its final 50km, it was BORA-hansgrohe on the front pushing the pace and decreasing the size of the gap. With 40km to go, the gap had dropped to less than half its size, and with 30km remaining, their lead was a little more than a minute. The narrow and winding roads made hard racing challenging, with some steep drops off to the side, as well as some rougher road surfaces. While the two remaining breakaway riders tried their best, it was all back together with 13km to go, only for a solo rider to go off the front. While this attack was quickly caught, this did set the tone for some aggressive riding as the finale loomed. Long, strung out groups dotted the road, but Peter and Rafał were in the lead group, which hovered behind the solo rider, Tony Gallopin, on the front, but in the final metres the sprinters weren’t able to make the catch and the win went to the Frenchman. In the reduced bunch sprint behind, Peter took second place with ease, holding off his rivals with a strong performance that showed how much he has recovered during the Vuelta. While Emanuel Buchmann was held up in a crash in the closing stages, the German rider, with the support of Davide Formolo and Jay McCarthy, pushed on hard to close the gap, staying in contention to keep hold of his third in the GC. As a precautionary measure, Emanuel will undergo medical evaluation after his crash to gauge the extent of any injuries. It’s not only the Vuelta a España in the first weekend of September, but UAE Team Emirates will be competing in two HC races in Belgium and France. On Saturday, September 1, the team is in Belgium for the Brussels Cycling Classic, formerly Paris-Brussels. It runs 201.4km with the start and finish in Belgium’s capital city. The next day in France, the team races the GP de Fourmies / La Voix du Nord. The 205km race covers a circuit in the city of Fourmies. Both races are ideal for fast men. 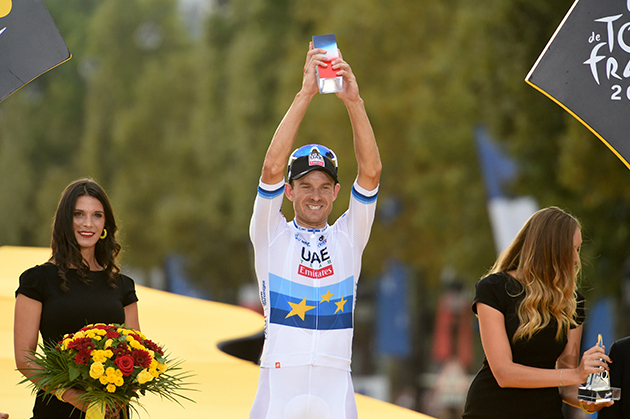 UAE Team Emirates will rally around Norwegian sprinter Alexander Kristoff. It will also bring in young stagiaire, 22-year-old Argentine Nicolás Tivani. The roster for the two races: Matteo Bono (Italy), Rui Costa (Portugal), Filippo Ganna (Italy), Alexander Kristoff (Norway), Marco Marcato (Italy), Nicolás Tivani (Argentina), Oliviero Troia (Italy). Sports Director: Daniele Righi (Italy).